To Cite: Keshavarz T, Akbarzadeh M, Moshfeghy Z, Khoshkholgh R, Kasraeian M, et al. Beat-to-Beat Variability During Auditory Music in Fetus and Mother: A Clinical Trial, Women Health Bull. 2017 ; 4(4):e13083. doi: 10.5812/whb.13083. Background: Non-stress test is the most widely used test to assess fetal status. The presence of beat-to-beat variability is reassuring while its absence is not reassuring. 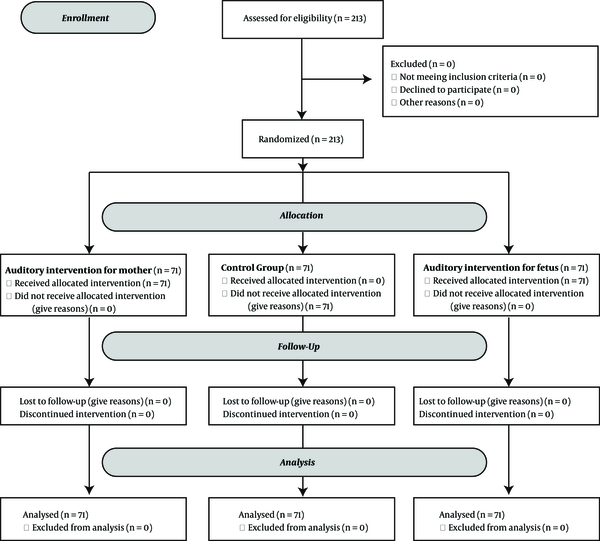 Methods: In this single-blind clinical trial, 213 pregnant women with gestational age of 37 - 41 weeks were randomly allocated into three groups (auditory intervention for mother, auditory intervention for fetus, and control), each containing 71 subjects. The data were analyzed using one-way ANOVA followed by Tukey HSD test and Kruskal-Wallis test. In addition, paired t-test was used to compare each group before and after the intervention. Results: The results showed a significant difference among the three groups regarding beat-to-beat variability of fetal heart rate in the second 10 minutes of the test (P = 0.006). Besides, the results of Tukey HSD test indicated that this difference was significant between the control group and auditory intervention for mother group (P = 0.004). Moreover, the results of t-test showed a significant difference in beat-to-beat variability of fetal heart rate between the first and the second 10 minutes of the test in both groups of auditory intervention for mother (P < 0.001) and for fetus (P < 0.001). Conclusions: Since beat-to-beat variability of the fetal heart rate is indicator of fetal health, music intervention can be used to increase the number of accelerations and reduce false positive results in NST. Electronic monitoring of fetal heart rate is sensitive for diagnosis of fetal disorders (1). Fetus is not completely independent of its heart rate regulation but the heart rate is to some extent controlled by the mother’s internal environment (2). Evidence has indicated that mother’s psychological status has an impact on the fetal heart rate (3). Investigation of fetal heart rate is a measure to examine fetal health and nervous development. There are common practices that encourage the use of fetal heart rate (FHR) and movements as primary techniques of prenatal assessment of fetal health; it is then broadly accepted to use these tests as primary tests of NST (4). Music exerts physiological and psychological effects through the brain on body organisms. Music impulses reach the auditory cortex in the temporal lobe adjacent to the limbic system through cochlear neuroreceptors. This system is considered as humans’ emotional brain. Here, music creates reinforcing impulses, leading to feelings of relaxation and well-being (5). Furthermore, studies performed on fetal acoustic stimulation have revealed no hearing problems in the fetuses exposed to acoustic stimulation (6). Up to now, a limited number of studies have been conducted on the effects of music and sound on fetal cardiac response (7, 8). Besides, such studies have only focused on mother or fetus, but have not compared the effects. Therefore, the present study aimed to compare the effects of two auditory interventions for mother and fetus on beat-to-beat variability of the fetal heart rate in pregnant women. This experimental clinical trial aimed to assess the effects of two auditory interventions for mother and fetus on beat-to-beat variability of the FHR and determine its relationship with baseline fetal heart rate. Based on a pervious study conducted on the issue in 2010 (9), considering d = 1.2, α = 0.05, σ = 2.2 and using the following formula, a 213-subject sample size was determined for the study (71 subjects in each group). The participants were selected through simple random sampling and then divided into three groups (auditory intervention for mother, auditory intervention for fetus, and control) using permuted block randomization. The inclusion criteria of the study were non-complicated singleton pregnancy, not suffering from hearing loss, hearing impairment, and chronic diseases; not using sedative and analgesic drugs; not having severe physical activity 2 hours before the study; passage of at least 1.5 hours from the last meal; and not smoking. The exclusion criteria of the study included occurrence of any problem during the study, not being willing to continue participation in the study, more than three consecutive positive (non-reactive) NST results, and uterine contractions. Music intervention was performed for mothers using headphones in the second 10 minutes of NST in the first intervention group. Besides, this intervention was performed for the fetuses using earphones at the beginning of the second 10 minutes of NST in the second intervention group. The third group was also considered as control. The utilized music for mothers was an instrumental duet by Paganini (violin and guitar) and Chopin (piano) recorded on a computer system or a CD player. This piece of music was played to the mothers using k44 headphones for 10 minutes through NST. After determining the location of the fetus’ head, music intervention for the fetus was performed at 95 dB for 15 seconds in the second 10 minutes of the test. The music was played through Phillips earphones with noise cancelling structure, which is used to eliminate surrounding sounds. During these 15 seconds, a piece of music with three piu fortissimos was played for the fetus. In order to effectively trigger the fetus’s hearing ability, we applied three distinctive rounds in accordance with the recommendation of our music expert. It should be noted that the maximum sound level did not exceed 95 dB and music was played on the mother’s abdomen and fetus’ vertex. Moreover, fetal electrocardiogram was recorded by Analogic Lite-TM device (made in Japan). At the end of NST, the electrocardiogram was scanned and returned to the patients. The control group received no intervention and no extra relationships were made with the participating women. In this single blind clinical trial, we first prepared the 20-min non-stress test segment with the Photoshop software by dividing it into two 10-min segments. We then applied each segment of music to our intervention and control groups. An expert unaware of the procedure reported the results. To our interests, we mainly measured the heartbeats, acceleration rate, baseline fetal heart rate, and beat-to-beat long-term variability. After all, the study data were analyzed using one-way ANOVA followed by Tukey HSD and Kruskal-Wallis test. Besides, paired t-test was used to compare each group’s measures before and after the intervention. All the tests were performed considering α = 0.05. This study was approved by the ethics committee of Shiraz University of Medical Sciences (numbered 90-5813). The study objectives had been explained to the subjects before they entered the study, and an informed consent was obtained from all. To incorporate any possible side effect of the mother’s belly fat and gravidity on our measurements, the matching factors were mother’s age, gestational age, mother’s body index, and mother’s BMI and gravidity in all the three groups. The results of ANOVA showed that there was no significant difference between the three groups in terms of maternal BMI (P = 0.452), gestational age (P = 0.224), gravidity (P = 0.844), and maternal age (P = 0.675). Also, the results of ANOVA revealed no significant difference among the three groups regarding beat-to-beat variability of the fetal heart rate in the first 10 minutes of the test (P = 0.136) (Table 1). However, a significant difference was found among the study groups in this regard in the second 10 minutes of the test (P = 0.006) (Table 2). Additionally, the results of Tukey HSD test revealed that the difference was significant between the auditory intervention for mother and control groups (P = 0.004). Nonetheless, no significant difference was observed between the auditory intervention for fetus and for mother groups as well as between the auditory intervention for fetus and control groups. Considering the baseline results of fetal heart rate, one can explicitly see that according to t test analysis, there is no meaningful difference between the values of the first 10-min time slot and the second 10-min time slot in both intervention and control groups. Recall that the first time slot stands for the no-intervention time slot, while the second one stands for the intervention time slot (Table 3). The results of t test indicated a significant difference between the first and the second 10 minutes of the test regarding beat-to-beat variability of the fetal heart rate in both intervention groups (P < 0.001) (Table 3). The difference in beat-to-beat variability of the fetal heart rate in the first and the second 10 minutes of the test was also statistically significant (P < 0.001). However, no significant difference was observed among the three groups with respect to the results of NST (reactive or non-reactive) (P = 0.073). The findings of the present study showed that the mean beat-to-beat variability of fetal heart rate was significantly higher in the auditory intervention for mother group compared to the control group. However, no significant difference was observed between the two intervention groups as well as between the auditory intervention for fetus and control groups in this regard. Jant (2008) conducted a study in the U.S. entitled “Fetal response to increase in maternal relaxation during pregnancy” on non-smoking normotensive mothers, without pregnancy complications, and singleton fetuses with above 32 weeks of gestation. In that study, relaxation intervention was performed through mental imagery and music. Maternal-fetal monitoring began once the women were comfortably positioned in a semi-recumbent, followed by an 18-min long guided imagery and progressive relaxation audio recording (“Beach Summer Day”, Suki Productions, Cincinnati, OH) delivered through headphones with lights dimmed. Systematic tensing was followed by relaxation of muscle groups or conscious release of tension without initial contraction. Data on fetal movement and heart rate were collected using a Toitu (MT320) fetal actocardiograph. The results showed that music intervention increased beat-to-beat variability, but the fetal motor activity suppressed and the baseline of fetal heart rate declined (10). The subjects of this study was non-complicated pregnant mothers. We applied the 20-min music segments, keeping in mind that the first 10-min segment is merely important to obtain a basis for beat-to-beat variability. This allowed us to compare the three groups not only during the intervention but also during the non-intervention period. Similarly, the research by Nickel et al. (2006) indicated a decrease in mothers’ diastolic blood pressure, sympathetic system activity, and heart rate due to relaxation exercises. Mothers’ relaxation also resulted in an increase in beat-to-beat variability of the fetal heart rate (11). Moreover, Kim et al. (2004) evaluated the impact of music therapy in pregnant women. The study results revealed that music therapy reduced mothers’ sympathetic system activity, leading to improvement in their cardiovascular function (12). In addition to comparison of the three groups, which was also made in previous studies, our study compared each group at intervention (the second 10 minutes) and non-intervention (the first 10 minutes) periods. The findings demonstrated a significant difference between the first and the second 10 minutes with respect to beat-to-beat variability of the fetal heart rate. This was consistent with the results of the study by Kafali et al. (2010) on fetal heart rate accelerations (7). However, that study compared the intervention and control groups, while the present study evaluated each group before and after the intervention. Beat-to-beat variability of the fetal heart rate is among the sympathetic-parasympathetic development indices and an indicator of fetal well-being. The current study results revealed a significant difference between the first and the second 10 minutes of the test regarding this variable. This was in agreement with the findings of the research by DiPietro et al. (2008) who investigated the effect of relaxation on the fetal heart rate and concluded that relaxation through mental imagery and music increased beat-to-beat variability of fetal heart rate (10). Fakheri et al. (2005) conducted a study on 380 women with term singleton pregnancy. This clinical trial was carried out on women in the active phase of labor (dilatation > 3 - 4), with cephalic presentation, without previous diseases and abnormal fetus. At first, FHR was monitored for 15 minutes; then vibroacoustic stimulation was done for 3 seconds using an artificial larynx of high-pitch intensity equal to 105 dB. Results were recorded as non-reactive and reactive FHR (twice 15 beats acceleration for 15 seconds). The results showed that fetal acoustic stimulation test could be helpful in reduction of suspicious cases of NST (13). The dropout criterion in our study was labor condition as the labor heartbeat substantially affects the fetus’s heartbeat. The 28-week fetus responds to sounds with the intensity of 90-110 dB. From weak 32, it is also responsive to repetitive sound tracks including “bi-bi”, “ba-ba”, and “bi-ba”. Eventually, near to the term period fetus shows sensitivities to some complex sounds including music (14-16). In our study, it was found a meaningful discrepancy in the beat-to-beat variability of the fetuses in the intervention and control groups. Note that the reduction of beat-to-beat variability indicates the reduction of oxygen level of the fetus (1). The findings of another research showed that vibroacoustic stimulation led to an increase in the fetal heart rate, reactivity, and heart rate accelerations (17, 18). In general, anxiety results from an imbalance between the mother’s internal and external environments, eventually leading to hyperactivity of the sympathetic system (19). Yet, interventions such as relaxation and music therapy decrease the sympathetic system activity, stress, and cortisol level (20), which can explain the reduction of anxiety level and improvement of fetal cardiac function. Ying et al. assessed the effects of music therapy on decreasing the mother’s anxiety in 120 pregnant women. The study participants listened to their favorite pieces of music 30 minutes a day for 3 days. The study findings indicated that music reduced the women’s anxiety, improved their physiological response, and regulated fetal heart rate (21, 22). Based on the present study results, music therapy is a method to create fetal response and movement, which is among the positive feelings during pregnancy. Considering the widespread use of NST and high prevalence of false positive results (50%), this intervention can be used to increase the number of accelerations and improve beat-to-beat variability of fetal heart rate. Yet, the effects of various music styles should be assessed to determine the appropriate music styles. One of the limitations of the current study was the lack of a specific room for performing the test. This forced us to use noise-reduction headphones. On the other hand, the induced manipulations during the NST test rendered inevitable consciousness of the fetus, which caused biased results. Besides, since manipulations during NST can lead to fetus’ consciousness and bring about bias in the results, the researcher performed all the tests. In the conducted study, we restricted the intervention time to 10 minutes. It might be appealing to extend this time slot in order to facilitate the scrutiny of possible positive effects. Music can improve the NST results and increase the number of beat-to-beat variability. Considering the fact that beat-to-beat variability of the fetal heart rate is an indicator of fetal health, listening to music is recommended during pregnancy. It is recommended that further studies be conducted on music in high-risk pregnancy. The present manuscript was extracted from Roghaie Khoshkholgh’s M.Sc. thesis in Midwifery (proposal No. 90-5813, IRCT201112108362N1). The authors would like to thank the research vice-chancellor for research of Shiraz University of Medical Sciences for financially supporting the study. The authors would also like to thank Shiraz University of Medical Sciences, Shiraz, Iran, as well as the center for development of clinical research of Nemazee Hospital and Dr. Nasrin Shokrpour for editorial assistance.